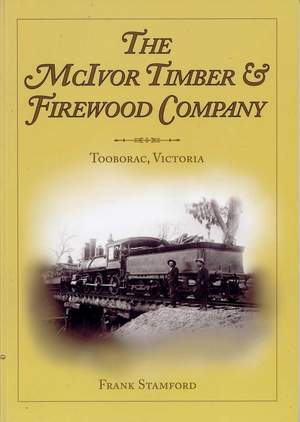 This book presents the history of the McIvor Timber & Firewood Company. The company operated from 1906 to 1927. Its main product was firewood for the Bendigo and Melbourne markets. To transport the firewood the Company built 5 ft 3 in gauge tramways from Tooborac to Mitchell's Creek, Puckapunyal, Moormbool West and Cherrington. The tramways were operated by two Baldwin 2-6-0 locomotives, and later an ex-VR W class 4-6-0. This book records the history and routes of these tramways, and gives details of remains which were found on extensive site inspections made between 1971 and 1986. Most of this area is now occupied by the army and is not accessible. At the time the Company operated, there were settlements at Major's Line and Moormbool West. This book gives an insight into the activities of these settlements, including social events, which the McIvor Company supported. The book includes over 103 photographs, 23 maps and diagrams, references, and index.